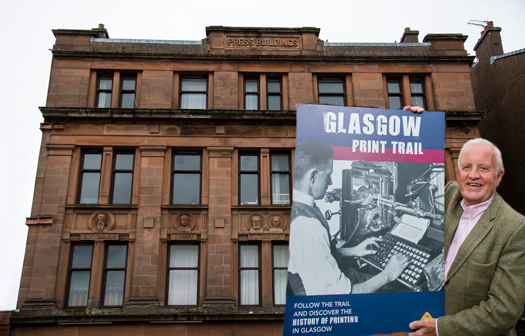 A historic look at Glasgow’s rich printing heritage has been captured with the launch of The Glasgow Print Trail. And who better to be behind this fascinating glimpse into the past than John Watson OBE who ran the eponymous printing dynasty John Watson and Company for over 50 years. Printing was a mainstay of the city’s industry’s – third only in importance to heaving engineering and shipbuilding. Now visitors to the city can take a trip down memory lane learning about the key printing businesses which employed thousands and helped, in their own way, to make Glasgow the second city of the Empire. John worked alongside the Scottish Printing Archival Trust which seeks to promote interest in the history of the Scottish printing industry. The research was carried out by archivist Helen Williams and the Trail is now available on the Trust’s website www.scottishprintarchive.org for £5. It follows the publication of a similar guide in Edinburgh published some years ago but there is one difference between printing in the Capital and Glasgow. Most of the historic print businesses in Edinburgh were located in and around The Royal Mile yet in Glasgow they had a much greater geographic spread ranging from Bishopbriggs where William Collins was latterly situated to, Finnieston and across the river to Govan. John explained: “I suppose it could be described as a labour of love. Having spent my entire working life in printing I wanted to make sure that the rich history of printing in Glasgow was not forgotten. It is a story undoubtedly worth telling. “Most people associated with the printing industry are generally agreed that there have been more fundamental changes in the last 50 years than in the preceding centuries since Johannes Gutenberg invented printing from movable type back in 1450. “The pace of change has been unrelenting and with technology and new processes, the ways of communicating the printed word have changed out of all recognition. Sadly the industry has, too, and many of the Companies have fallen by the wayside. When John made a successful exit from John Watson and Company in 2015 where he was Chairman and Chief Executive he created The Watson Foundation which has funded the research for the new Print Trail. The Foundation has focused strongly on philanthropic work – notably working with social entrepreneur Josh Littlejohn MBE in helping to fund the fight against homelessness through Social Bite. There have been other donations to The Outward Bound Trust and to help fund the work to restore the iconic Clyde steamer TS Queen Mary along with helping young children in Govan access free musical tuition through the Govan Schools Pipes and Drums Association. John was on the fundraising Board of the work to create the new Stobhill Marie Curie Hospice. A large number of smaller charities – which are rarely in the spotlight – have also benefited. He said: “I have been very fortunate in business. Retirement provided the opportunity to give something back to the city which I have always called home. “For me the print trail is a walk down memory lane and an attempt to ensure the history of printing is not lost as the years roll by. It really was crucial to the commercial success of Glasgow and I don’t want that strong heritage lost in the mists of time. The publication of the Print Trail was made possible thanks to its generous free printing by another icon of Scottish printing – Bell & Bain – which is one of the oldest surviving printers in the UK and was founded in 1831. It is now based in Thornliebank. *John chose Govan for the launch of the Print Trail because of the location of John Cossar and Co in what was known as the Govan Press Buildings. It published The Govan Press local paper.